Ashley Stevens, right, taking a selfie with her father, left and boyfriend Christopher Reed, middle. When Ashley Stevens took a selfie with her father and boyfriend Christopher Reed after catching the bouquet at her cousin’s wedding and posted it to Facebook, she never imagined that millions of people would be talking about it. But talk they did -- and not all in a positive way. A friend of theirs posted the photo to Reddit thinking it was funny, and the result was thousands of people commenting, many in a derogatory way against Reed, 21, for his weight and saying it looked like he had Down Syndrome. Reed’s first reaction when he saw the comments was to laugh it off, he said. “Honestly, I’ve always been a big guy the majority of my life and so of course I had the comments and the cruel jokes growing up, so I kind of got used to it. I know who I am and I really don’t care what people have to say about me because I’m confident,” he told ABC News. "It’s trolls sitting behind their computers. They don’t know us and they can't talk about us, so honestly it just didn’t bother me." 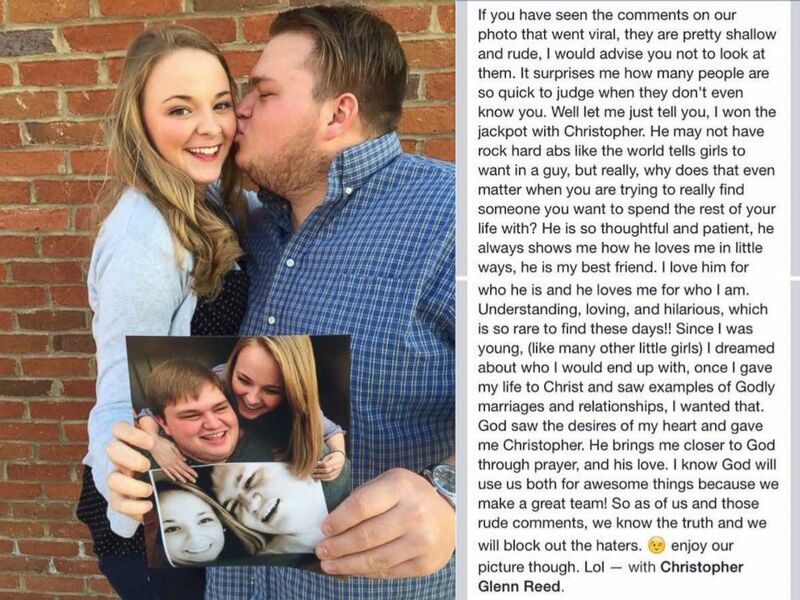 Ashley Stevens took to Facebook to defend her love for Christopher Reed. Stevens goes on to talk about how thoughtful and patient Reed is. Stevens and Reed, who live in Columbus, Georgia, have gotten a lot of support from friends. As for the haters? Stevens and Reed have taken the high road.